The owners of an Edison telemarketing company that did fund raising for police and other non-profit organizations have agreed to pay $18.8 million in fines and permanently get out of the business to settle a lawsuit brought by the Federal Trade Commission. The fine paid by Civic Development Group and its owners, Scott Pasch of Warren and David Keezer of Monmouth Beach, is the largest civil penalty ever awarded in an FTC case. The government accused CDG of misleading consumers into believing that they were donating directly to various police, firefighters and veterans charities, when in fact nearly 90 cents out of every dollar contributed went into the company’s bank accounts. Although Pasch and Keezer didn’t admit to any wrongdoing, each will pay the federal government about $6 million in penalties under the settlement agreement. The remainder of the fine will be paid by the company itself. Exhibits attached to the settlement agreement offer some insight into the lavish lifestyle CDG’s principals have been living. Among the holdings the owners have already sold off or will have to liquidate are Pasch’s $2 million home in Warren, Keezer’s $2 million home in Monmouth Beach, three Mercedes-Benzes, two Bentleys and paintings by Picasso and Van Gogh. Even a 14-karat-gold diamond engagement ring is listed among the items that may be up for sale. Pasch, Keezer and CDG also are defendants in a similar lawsuit pending against them by the California Attorney General’s Office. CDG was the largest of several telemarketers cited in an investigation by The Record last September into the practices used by telephone solicitors to raise money for police organizations. For several years the company was the principal fund-raiser for the New Jersey State Lodge of the Fraternal Order of Police in Trenton. According to its 2007 tax return (the most recent the group had filed at that time), the police group raised $4.15 million from the public — of which $3.64 million went to CDG. Late last year, the Fraternal Order of Police announced it was phasing out its public fund-raising efforts, and instead would rely solely on members’ dues to fund its activities. “The FOP severed its ties with Civic Development Group in December,” spokesman Ernest Landante Jr. said Wednesday. This week’s settlement closes a lawsuit in which the FTC accused the company of violating the terms of a 1998 consent order, as well as the FTC’s telemarketer regulations. In the 1998 settlement with the federal government, CDG denied having engaged in deceptive practices such as telling donors the phone solicitors worked directly for the charities, but agreed not to make use of them in the future. The government said Wednesday that CDG tried to evade the earlier order’s requirements by calling itself a consulting firm and claiming that its telemarketers thus became contract employees of the non-profits. When they had potential donors on the phone, the commission alleged, CDG workers would say they were employees of the charity. The government also alleged that the company’s callers would insist that 100 percent of any donation went directly to the charity, when in fact the money went to an account controlled by a company headed by Keezer’s mother. This latest settlement bars the company and both men from ever engaging in the charitable fund-raising business; in addition, they are barred from the telemarketing industry, even for profit-making companies. This is at least the sixth lawsuit filed by the federal or state governments against CDG since 1995 that resulted in the company agreeing to pay fines and to not engage in deceptive practices — including one brought by New Jersey, which received $125,000 to settle a lawsuit in 1999. Roseland attorney Matthew Oliver, who represented Pasch, didn’t return a phone call seeking comment. Keezer’s lawyer, Edward J. Dauber of Newark, was unavailable. Among the other items the two men are giving up is $4.3 million Keezer has in nine bank accounts. He will also be selling his 2007 Cadillac Escalade, 2006 Bentley and a Sea Ray Sundancer cruiser boat. In November, Pasch listed nearly 1,000 vintage bottles of wine with an auction house in White Plains, N.Y., including a Lafite Rothschild 1989 valued at as much as $4,400. He is also auctioning off 30 classic guitars, including three Gibson Les Paul Customs valued at a total of more than $200,000. Pasch is also selling off paintings by Picasso and Van Gogh. A Jan. 30 letter from the owner of the Russeck Gallery in Palm Beach, Fla., to Pasch’s wife, Lisa, notes, “Sadly I am unable to get any real offers on your pieces,” which include a 1937 Picasso ink drawing titled “Minotaur.” “The only offers have been in the $300,000 to $400,000 range,” the letter adds. An Edison company is being sued by the Federal Trade Commission on charges of misleading the public.A Milwaukee-based firm paid $200,000 in May to settle lawsuits by 33 state regulators alleging it used lies and exaggerations to get people to donate money.An Arizona outfit recently paid $30,000 to settle a lawsuit by the Iowa attorney general accusing it of deceptive fund-raising practices.What do they all have in common?If you get a call asking for a donation to a police organization in New Jersey, the odds are good that someone from one of these firms is on the other end of the line.And while the callers may leave you with the impression that they’re from the police, there’s a good chance they’re ex-cons and not cops.Oh, and that donation you sent in? The non-profit probably got less than 15 cents on the dollar — the rest stayed with the telemarketers. And after various expenses were taken out by the police group, even less went to support the stated purpose of the original pitch, such as buying bulletproof vests or helping the families of cops killed in the line of duty. Ask whether the caller works for the non-profit organization or a private telemarketer. If the answer is the non-profit, ask this follow-up: Are you sitting right now in that organization’s office, or are you working from a call center? Who’s benefiting from your donation? Make sure you ask what police department’s officers will benefit from any money you give, and insist on a specific answer. How much will the non-profit receive? Federal law requires telemarketers to tell you what percentage goes to the non-profit. Ask the caller to mail you more detailed information. Never give out a credit card number or other personal information. If you want to make sure the non-profit gets 100 percent of your donation, send it directly to the organization’s address instead. Know that once you donate through a telemarketer, the company most likely will add you to its list of people to call in the future, even on behalf of other non-profit groups. 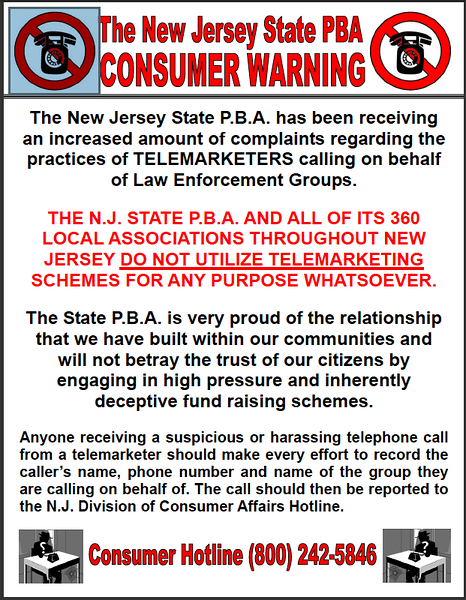 — Harvy Lipman”If you’re using telemarketers, you know you’re involved in a scam, shaking people down for donations when the money is not going for what they say it is,” said John Hulse, second vice president of the New Jersey State Policemen’s Benevolent Association. The PBA, the state’s largest police union, stopped using telemarketers about 15 years ago, concerned that public disdain for phone fund raising was hurting its image. “These programs are high pressure and they prey on the elderly. It’s far from anything a group associated with the police should be involved with.”But many are.By far the largest is the New Jersey State Lodge of the Fraternal Order of Police in Trenton. The group is the state’s second-largest union representing police officers and also functions as a fraternal organization for cops in many departments where the PBA handles collective bargaining.According to its 2007 tax return (the most recent the group has filed), the FOP raised $4.15 million from the public — of which $3.64 million went to its Edison telemarketing firm, the Civic Development Group.That means that for every dollar someone contributed, 88 cents stayed with the telemarketer.In a written statement responding to questions e-mailed to the FOP by The Record, spokesman Ernest Landante Jr. said that the money it raises has been used to support families of officers killed or injured in the line of duty and to support charitable efforts, including an ad campaign against drunken driving, a scholarship program and several New Jersey charities.Landante said 30 percent of the money that’s left after the telemarketer takes its cut goes for such charitable activities. The remainder, he added, is spent on operational expenses and services for FOP members, “including training local lodge leaders and protecting the interest of New Jersey police officers in Trenton.”The organization has to hire a professional fund-raiser, Landante added, because it can’t afford to buy high-tech telephone equipment and hire people to make the calls.Even so, the New Jersey lodge, following a trend started by its affiliate in Illinois, has announced plans to wean itself from reliance on telemarketers by the end of next year. “The NJFOP recognizes that to become a more financially stable organization, it should also become more financially self-reliant,” Landante said. To accomplish that, its leaders are pushing a plan to raise dues.Ted Street, president of the Illinois FOP, has spent the past seven years working to get his organization to drop telemarketers. He finally succeeded this year.”I felt it was an insult to call John Q. Public and ask for money from people who in many instances are making less than police officers make,” Street said. “It’s preying on people on fixed incomes and Social Security. In Illinois the wages and benefits for police officers are very competitive. You have an organization representing people making six-figure salaries calling people who make $40,000 and asking them to help us out. And in our state at least, police pensions are 75 to 80 percent of your salary. I don’t want any part of it.”The compensation paid to police in New Jersey is similar; experienced officers, especially those in the Bergen and Passaic counties, routinely more than $100,000 in base salary, according to employment contracts on file with the state.Much of the fund raising by police groups asks for donations to help the families of deceased officers. While no one would deny the devastating impact of the loss of a family breadwinner, the state’s retirement system already provides generous benefits for a surviving spouse: a one-time payment equal to 3 1/2 times the officer’s final compensation plus an annual pension equal to 70 percent of that salary.